Ricotta-Almond Cake: Make it. Eat it. Die happy. 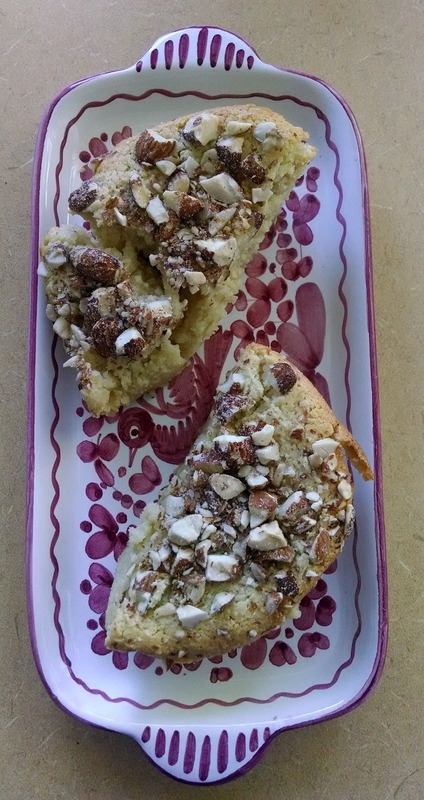 I was Googling around looking for Italian food post ideas, and saw this Ricotta-Almond Cake picture on a website called Italian Food Forever. I love almonds, but it sounded like it might be a complicated pastry thing, and maybe more than I wanted to try making. However, in its favor, I was recently given a container of almond meal/flour, which was one of the (rather short list of) ingredients in the recipe, and I had been looking for a way to use it. Sometimes I find foods and recipes online that look good, and I blog about them without making them myself. But this time, I decided, I’ll make it and report the results. The only ingredient I didn’t have on hand was ricotta, which was easily solved at the grocery store. I also used low-fat ricotta rather than the full-fat called for in the recipe, and instead of sliced almonds, I took some whole almonds and whirled them in my mini food chopper for a chopped up texture. I cannot be trusted with full recipes of dessert lying around the house, so I halved the recipe, and then baked the cake in two small pie tins–the kind that frozen pot pies come in. (I confess I don’t own a springform pan, but I could borrow my mom’s.) 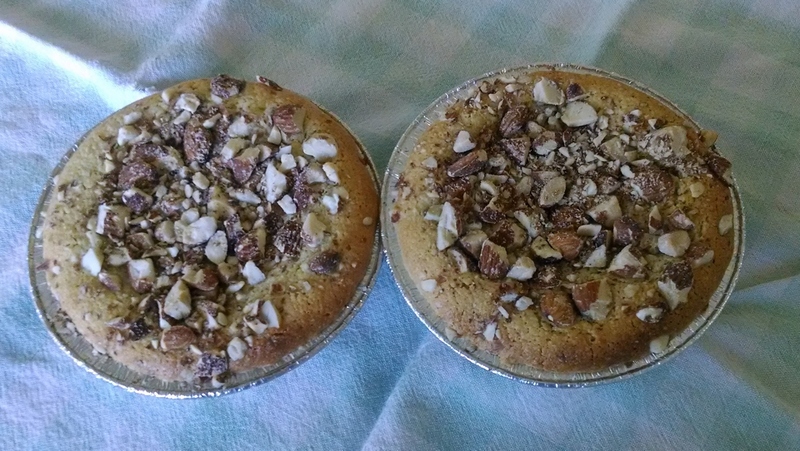 Fortunately for me, a fellow Italophile stopped by while the cakes were in the oven, so I gave one of them to her. I was left with one small cake to share with my hubby. I cut it in half and took a photo of it on a favorite plate I brought back from Italy… and then before I even started making dinner I took a bite of the dessert. With all the self-control I could muster, I took the plate to my husband and offered him a bite. I did manage to save half of it for us to eat after dinner! It was moist and rich, yet not heavy as I had expected. I will be making this again. You should too! Use baking spray or lightly grease and flour a 9-inch springform pan. Use an electric hand mixer to beat together the ricotta cheese, egg yolks, extract, and sugar until smooth. Stir in the lemon zest and almond meal. In a clean bowl, beat the egg whites until soft peaks form. Fold half the egg whites into the almond mixture, then fold in the rest. Spread the batter into your prepared pan and sprinkle the top with the sliced almonds. Bake the cake for 40 to 45 minutes or until a cake tester comes out clean. Cool the cake for 10 minutes then remove the sides. Cool completely, then lightly dust the top with powdered sugar and serve. I didn’t get the prep time down to ten minutes, but I found it wonderfully easy to put together, and definitely something I’d serve for special occasions or for dinner guests. The Italian Food Forever website contains a trove of recipes, and lots of other Italian resources besides. The recipes are well indexed making it easy to find what you want, and the photos are delicious to look at. It inspired me, and might just inspire you as well!